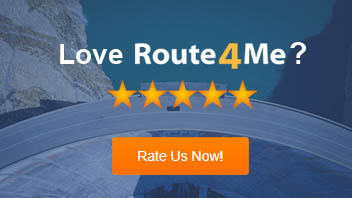 At Route4Me, we’re always working to improve the services we offer to our customers. Recently, we’ve launched a barcode scanner feature, weather map layers on the Route4Me Android app, an offline mode feature, and a dynamic stop insertion feature to provide our customers with a better route planning experience. 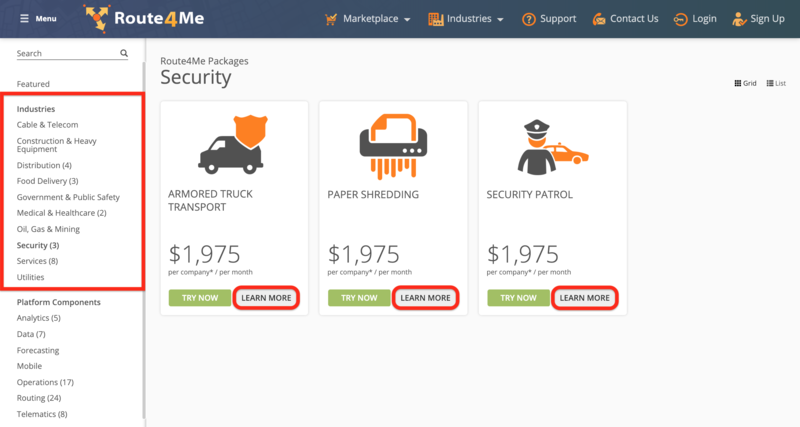 Now, we’re introducing a new Route4Me marketplace that allows you to customize your subscription plan. 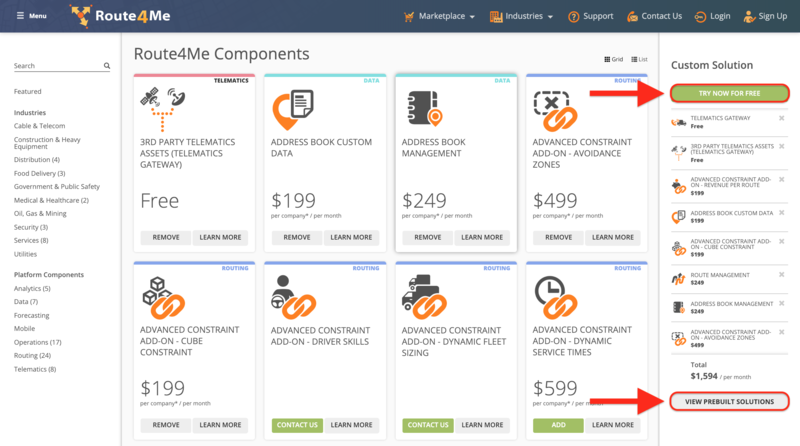 What Is The Route4Me Marketplace? 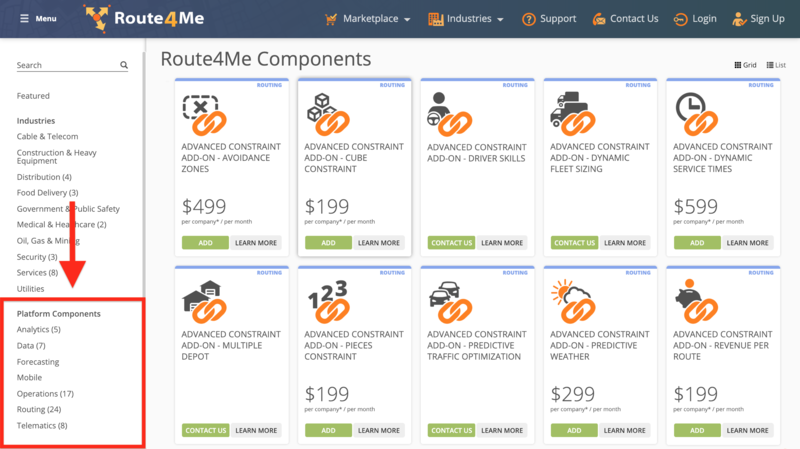 As the name suggests, this is a marketplace where you can browse and purchase Route4Me modules. It offers 100% transparent pricing with built-in bundle discounts. 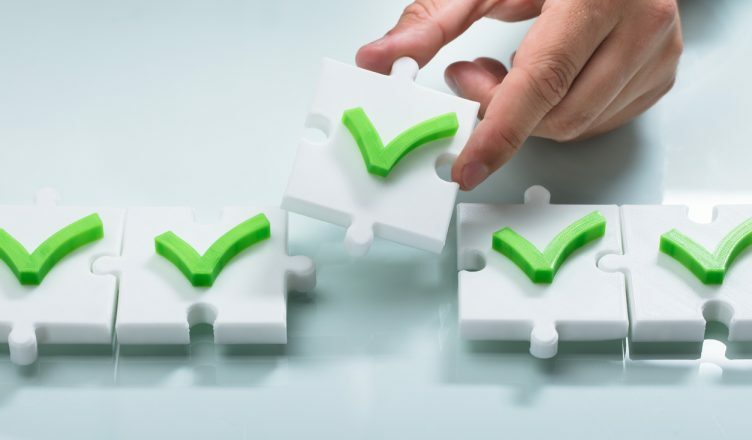 For your convenience, you can choose a package of preselected modules that are focused on solving the problems faced by your specific industry. You can also put together your own solution from the wide range of modules available on the marketplace. The marketplace comes with a shopping cart, so you can select and subscribe to your preferred module packages on your own with zero hidden features or secret menus. All packages are billed on a recurring monthly basis. You will be sent purchase receipts and upcoming renewal notices automatically. If you’re already using Route4Me, don’t worry! You’ll be completely unaffected by the marketplace unless you want to try new modules or features that don’t come with your existing paid subscription plan. In that case, you can opt for an upgrade to the newer pricing model. Mobile app pricing and features remain unchanged, and you can’t purchase marketplace packages through the mobile app. Accessing the Route4Me marketplace is easy. 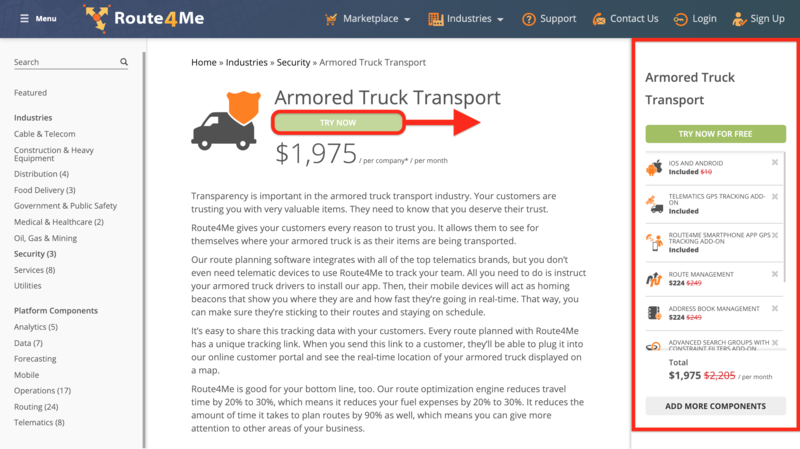 Just go to route4me.com, hover your mouse over the “Marketplace” tab on the front page of the site, and you’ll see the list of module categories. There are three filters you can use while browsing the marketplace: featured packages, industries, and platform components. You can also find a particular package or module by searching for any keywords that their name or description might contain. Select “Learn More” next to an industry package to review the modules that the package includes. To learn more about a particular module, click on it to navigate to the module page. Select “Try Now” to add a package to your shopping cart. You can continue shopping for more packages and modules while the package is in your cart. 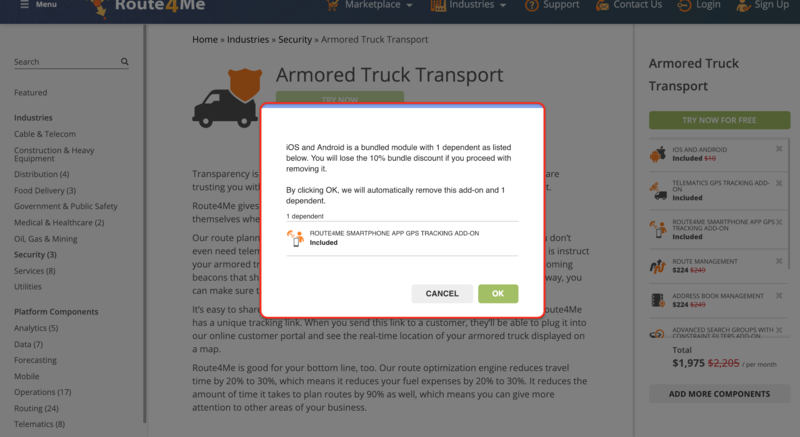 You can remove modules from an industry package if you believe they are unnecessary for your business, but this will remove the 10% bundle discount. Replacing a removed module with another module will restore the 10% discount. To do so, go to the “Platform Components” section and select “Add” next to the modules you want to include in your subscription, as shown below. Please note that some modules may require you to add dependencies, which are supplementary add-ons that must be included in your subscription plan for you to fully benefit from using the selected module. Select “OK” to add the required dependencies to your shopping cart. Select “Try Now For Free” to create a new Route4Me account based on the selected plan and complete the subscription process. 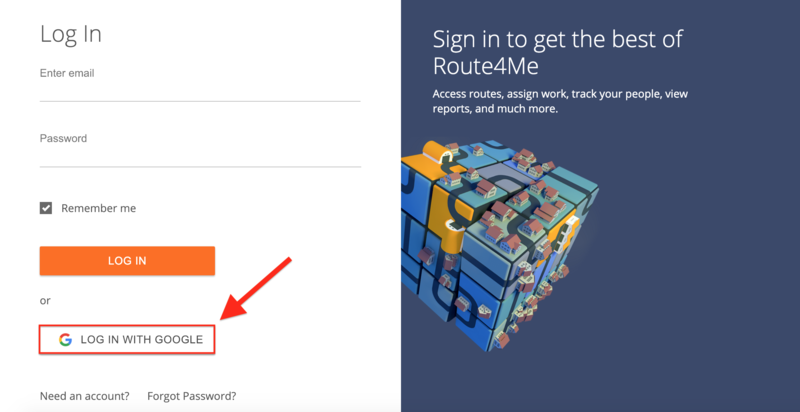 You can sign up for Route4Me with your Google account, or you can create a new account by filling in the required details, such as full name, email address, phone number, and business info. Then, you’ll need to verify the details through your email or phone. 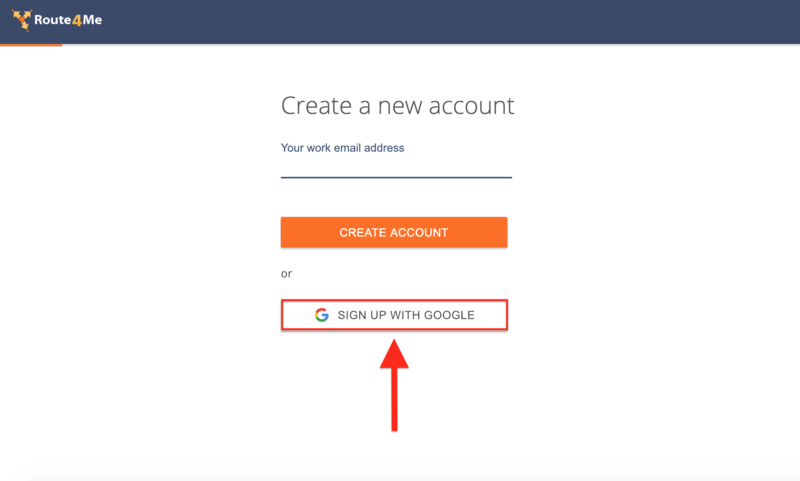 Please note that if you sign up with Google, you will only be able to access your account by using the “Log In With Google” login method. To create a new password specifically for your Route4Me account, you’ll need to reset it here. By default, you get a free seven-day trial for your subscription after registering a new Route4Me account. Once the trial period is over, you need to get a paid subscription to continue using Route4Me’s services. 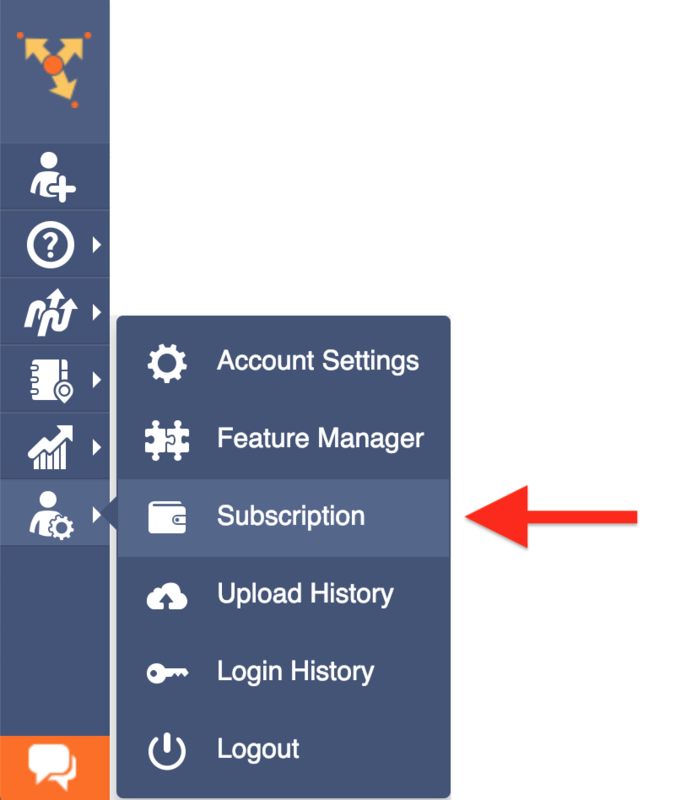 To view, edit, or pay for your subscription plan, go to “Subscription” from the navigation menu, as shown below. The “Subscription” page will provide you with a detailed overview, list of included features, and the pricing of your subscription plan. Read this article to learn how to edit and customize your subscription plan. Once your trial period is over and it’s time to pay for your subscription plan, select “Checkout”, then select “Proceed”, and enter your billing information and payment method. 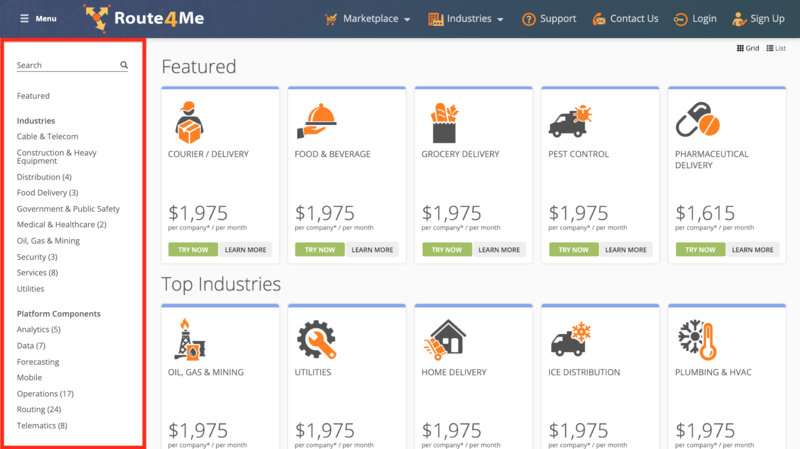 So, what do you think about the new Route4Me marketplace? Do you have any questions about this article? Feel free to let us know in the comments section below.